I’m now 20 weeks pregnant with baby #4! Yay! I’m planning to revamp my Preparing for Baby series in the next few weeks, but until then I thought I’d add a new post on the pregnancy essentials that I absolutely have to have. I’m a pretty frugal girl, so I don’t necessarily splurge on a lot of things while pregnant (eh um…other than takeout when I’m too tired/sick to cook). I figured I would show you my must-haves! These are great pregnancy tips! 1. Pregnancy Tea – I love Traditional Medicinals Pregnancy Tea! The flavor is so yummy that I don’t always need sweetener. Sometimes I add a little raw honey to it. I start very sparingly in the first trimester, and by the third trimester I drink 3 cups per day. 2. Cocoa Butter – Growing bellies get dry and itchy. Yes, I still get stretch marks, but the cocoa butter makes the itching bearable. This was very helpful during my second pregnancy when I developed a PUPPP rash. 3. Pregnancy Pillow – Sleeping is uncomfortable as the belly grows. I use my pregnancy pillow to position myself so I can get somewhat comfy. 4. Yoga Pants – Yoga pants are self-explanatory. Most comfortable pants ever! 5. Prenatal Vitamins – There are tons of prenatals on the market. I can’t afford really expensive prenatals and I have successfully used these through three pregnancies and nursing. I have recently added extra calcium and fish oil, too. 6. Burt’s Bees Lip Balm – My husband and I both use Burt’s Bees lip balm. It’s awesome! 7. Stability Ball – I have horrible back pain during pregnancy. A stability ball takes the pressure off. I also bounce on it in preparation for labor to help baby get into position! 8. Tums – Pregnancy and heartburn go together like peas and carrots. Tums helps relieve it! 9. Maternity Belt – This is new for me, but if I’m going to be on my feet all day I need a maternity belt. My SI joint causes the most horrific pain that makes walking excruciating by the end of the day if I’ve been active. So, those are the things I have to have! 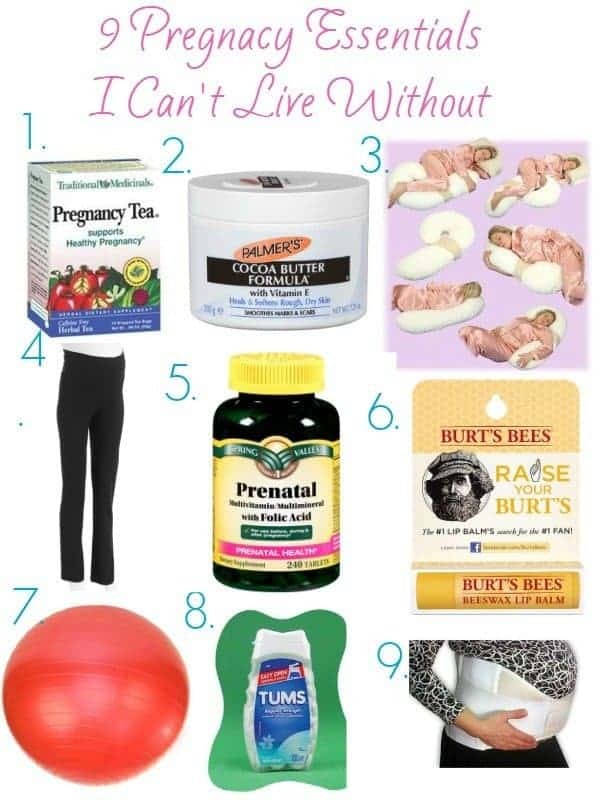 What are your pregnancy essentials?